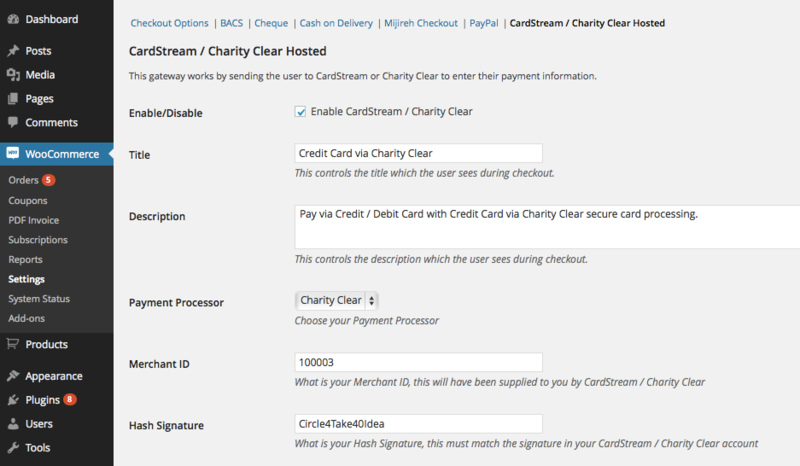 WooCommerce CardStream / Charity Clear Extension: allows you to accept credit card payments via CardStream or Charity Clear on a secure, hosted payment page. This gateway lets you accept credit card payments via a secure, hosted payment page using CardStream or Charity Clear, simply select your payment processor in the settings. Because the payment is handled off site, no SSL certificate is required on your site. CardStream and Charity Clear offer an affordable, online payment gateway enabling your business to accept all major payment methods and credit and debit cards, including Diners, MasterCard, Visa, Amex, Maestro and JCB. On your store, when an order is placed by a customer, the customer is taken to CardStream or Charity Clear to make a secure payment. After the customer completes their payment the order is confirmed and they are returned to the thank you page on your site.